A car collided with a fire engine which was responding to an incident in Edinburgh this morning. The crash happened at the junction of Hanover Street and Queen street at about 7:45am, resulting in lengthy delays for motorists in the city centre. Other motorists claimed the car left queuing traffic and struck the emergency vehicle. A fire service spokesman said the crew was responding to an alarm call at a building in Edinburgh at the time, and that this was covered safely by another appliance. 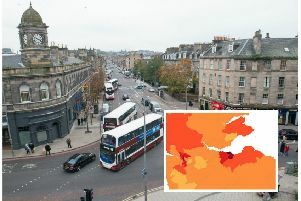 The spokesman said: “At around 7.45am on Monday, March 18 a fire engine responding to an incident in Edinburgh was involved in a collision with another vehicle. “One individual was assessed at the scene, but did not require any further treatment. A police spokeswoman also confirmed that they responded to this morning’s collision. No one was hurt as a result of the collision.